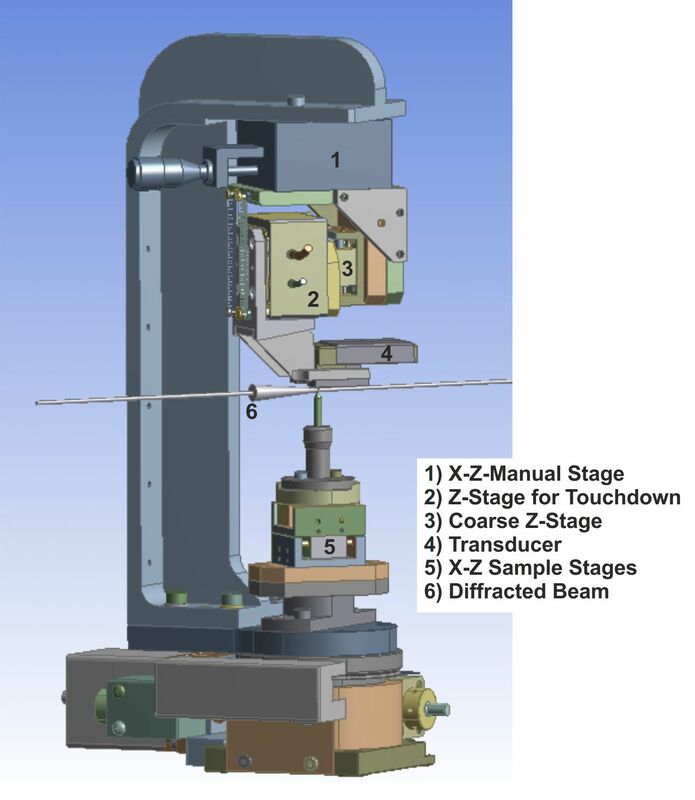 In search for the origin of the smaller-is-stronger paradigm, I designed and implemented an in-situ micro-compression setup at the micro-diffraction beam line at the Swiss Synchrotron (SLS). A schematic of the in-situ device is shown to the right. With this experimental method, metallic nano- and micro-pillars could be compressed, and at the same time micro-beam Laue diffraction was performed on the deforming pillars. The sensitivity of the x-ray method revealed a vast number of pre-existing defect structures present in as-prepared single crystalline pillars. During deformation, local crystal rotation, the build-up of rotational gradients, and the time-resolved evolution of the dislocation structure could be traced. The major finding of this work is that the deforming pillars accumulate dislocations, form dislocation substructures, and therefore strain harden. Experiments on taper-free Ni pillars in collaboration with Dr. M. Uchic also revealed that smaller specimen exhibit a more pronounced increase in dislocation structure during initial loading than larger pillars, and that little changes occur after the break-away stress. The here obtained qualitative in-situ results are in very good agreement with post-mortem TEM studies on dislocations structures.